$6.95 This item is selling for $6.95 on eBay. 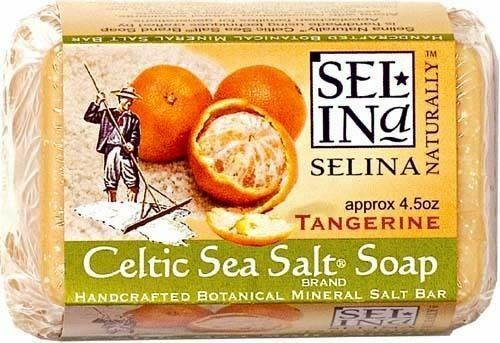 Celtic Sea Salt Soap Handcrafted Botanical Mineral Salt Bar 4.5 oz Tangerine Reinvigorate, exfoliate, detoxify and feel refreshed and most of all cleansed with all natural, long lasting Celtic Sea Salt Brand Sea Salt Bath Soap. Celtic Sea Soaps are handmade using traditional mountain techniques typically used in homes of Appalachian families for generations. Celtic Sea Salt has been added to this tradition to bring live minerals and exfoliation action to the soaps. This soap is alive! Watch as the texture and appearance change. As you use the soap, the Celtic Salt crystals will migrate to the surface, bringing the benefits of minerals directly to your skin. The natural emollients, essential oils and pure plant extracts also included further enrich the rejuvenating effect of Celtic Sea Salt Soap. INGREDIENTS Coconut oil, palm oil, olive oil, vegetable oil, sodium chloride (Celtic Sea Salt),natural plant based lye, cocoa butter, vitamin E (not from wheat), and certain essential oils depending on variety. May include rolled oats, dried flowers, herbs and spices. Does not contain any animal products, petroleum, lard or synthetic detergents. 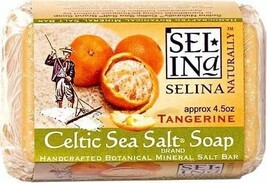 Celtic Sea Salt Soap 4.5 oz Bar Tangerine See more Bar Soap Search Suncatchers of Hilo for Your Favorite Hawaiian Bath Body Products Authorized Distributors of Hawaii's Best Brands at the Lowest Prices! Available by the Case. Save with Combined Shipping. BUY IN BULK SAVE BIG PayPal—eBay's service to make fast, easy, and secure payments for your purchases! Powered by Turbo Lister The free listing tool. List your items fast and easy and manage your active items.